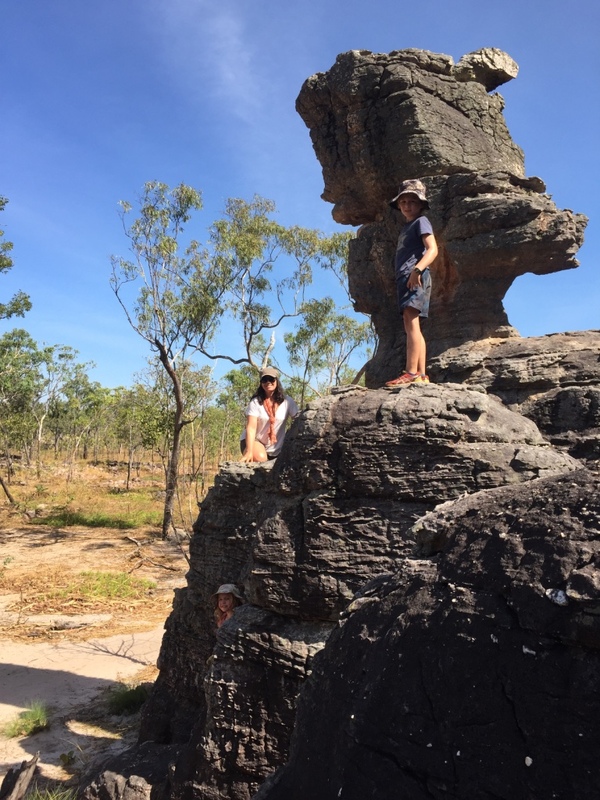 We were excited about heading to Litchfield National Park – this park has many beautiful sights to visit and see. 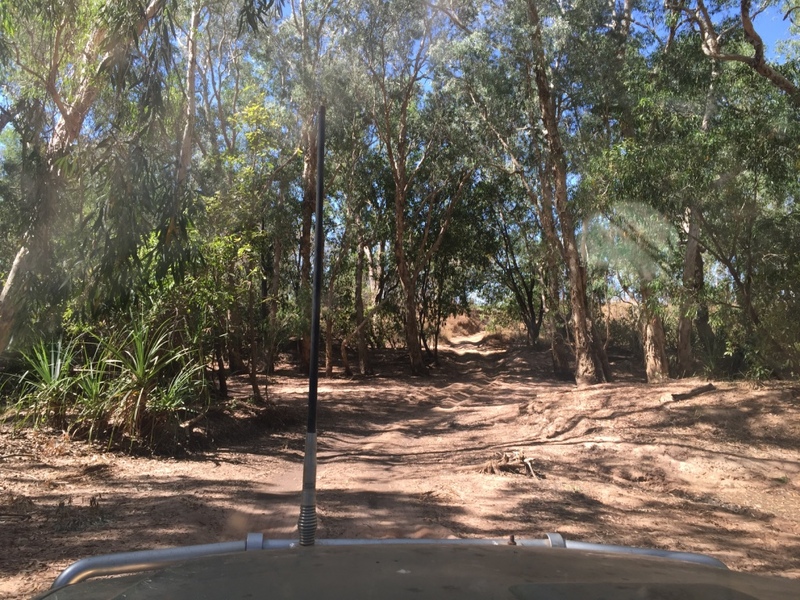 We were coming from the south entered the park via the Reynolds Track a 4×4 track. 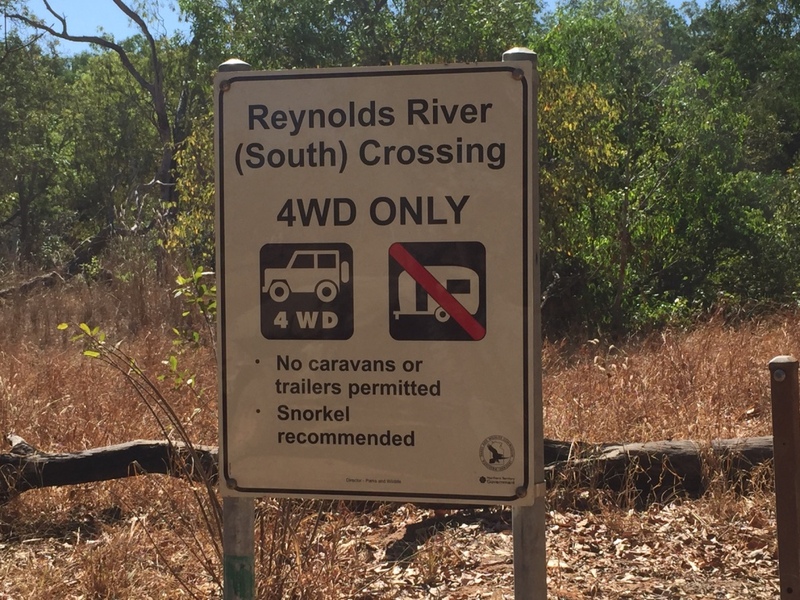 (Of course) The track was pretty good going however about 20km up the track we came to this sign…however the ‘deep crossing was dry’ phew no worries and on we went. 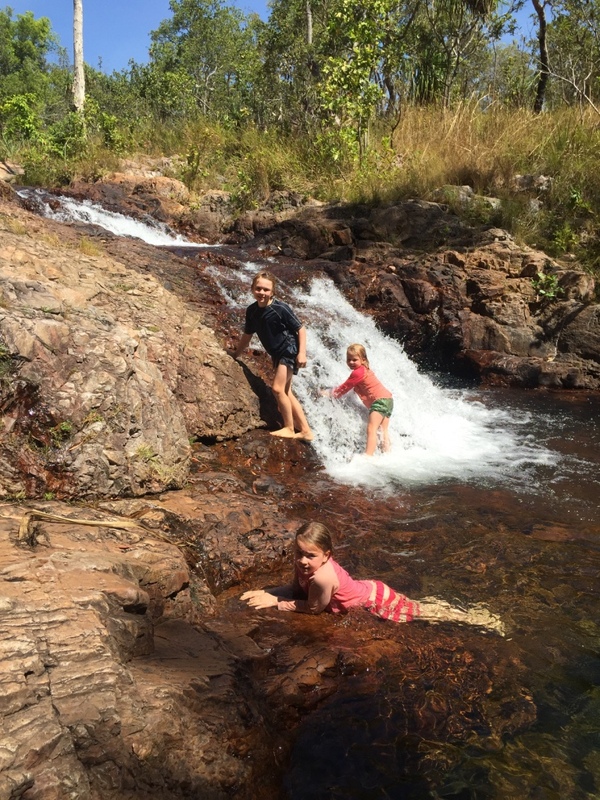 We walked up the short walk to the falls to find them only a trickle but enough that the two top deep rock pools were fine for swimming but the lower pool was stagnant. 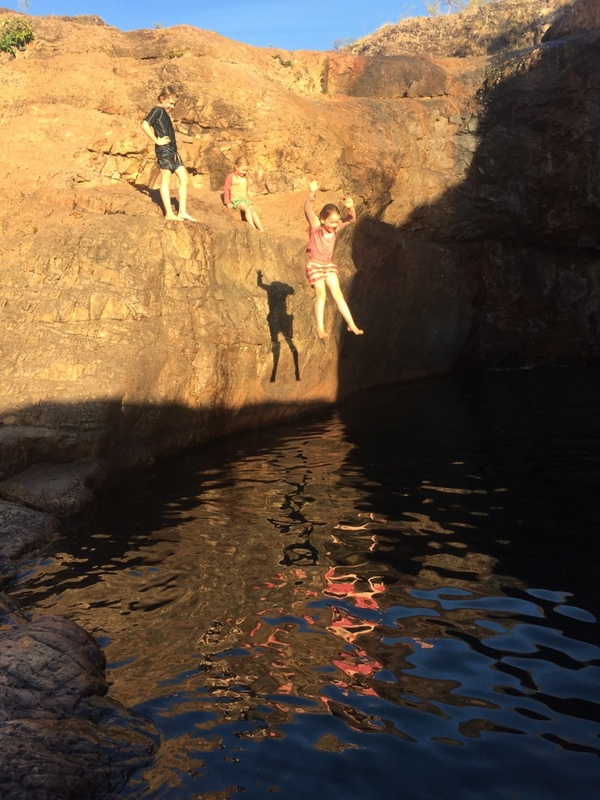 We spent a couple of hours swimming with the kids all having a ball jumping from points around the rock pool. 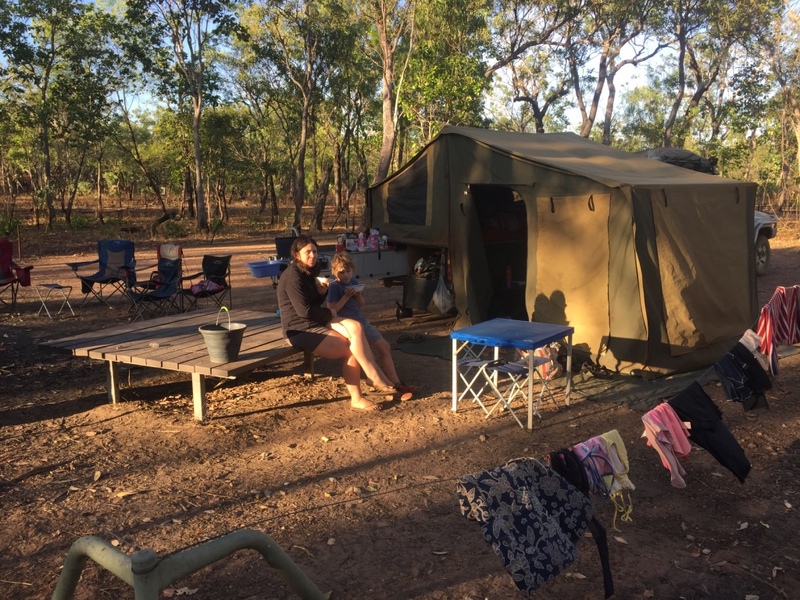 Our first night at Litchfield we camped at Surprise Creek Falls and we had the camp ground to ourselves….a surprise indeed! 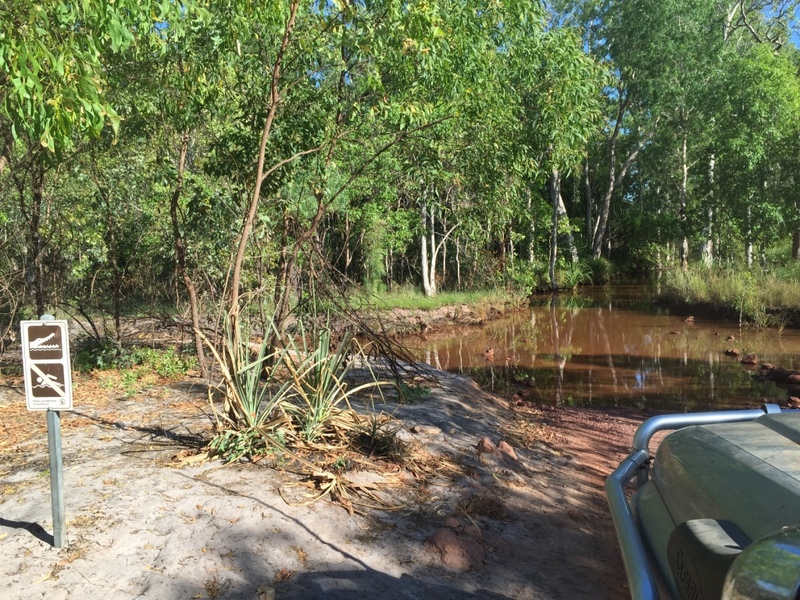 The next day we moved further up the track to the Sandy Creek Falls along the way we had to cross Surprise Creek which wasn’t dry it was a relatively deep looking crossing which was also wide with a sandy creek bed…and crocodile risk warning signs just to make things interesting. 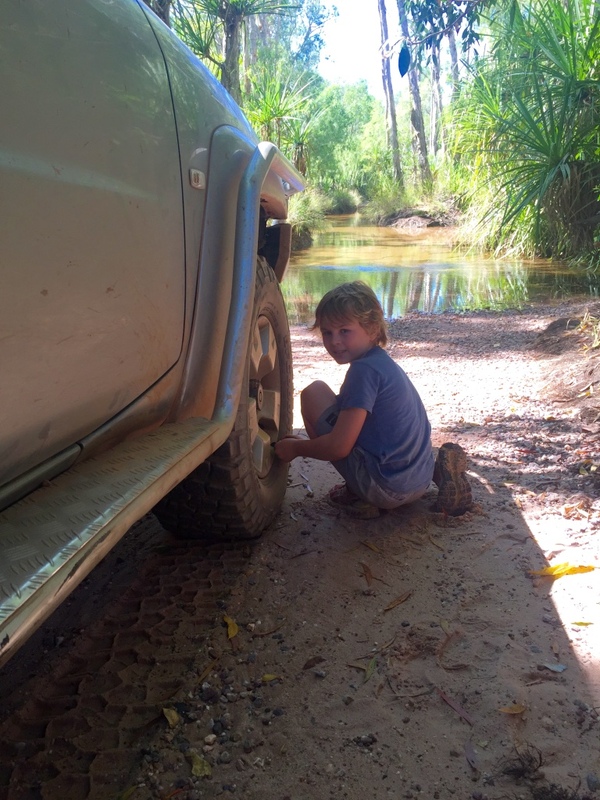 Not wanting to wade through and ‘walk the creek’ to ensure we would easily cross the creek Andrew and Aaron let the tyres down to 17psi on the car and trailer. 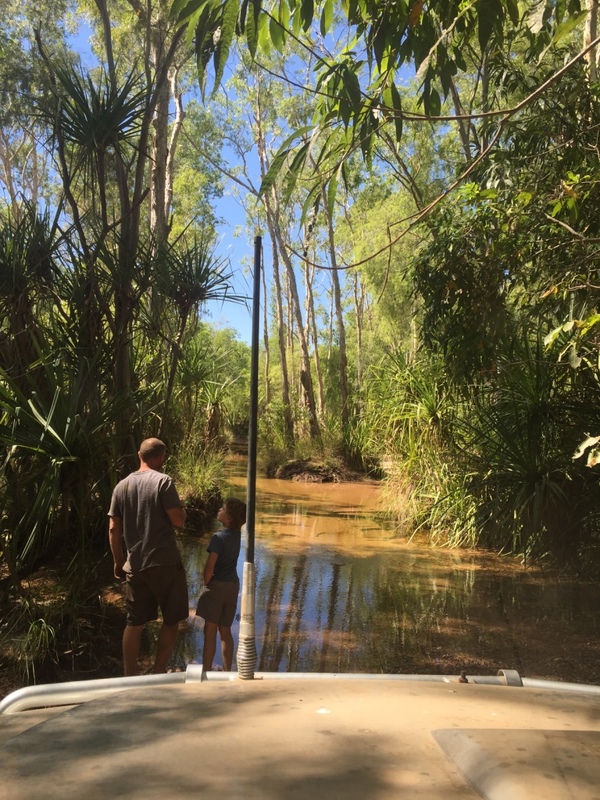 The creek was deep 70cm and up over wheels with the wash but we crossed easily. 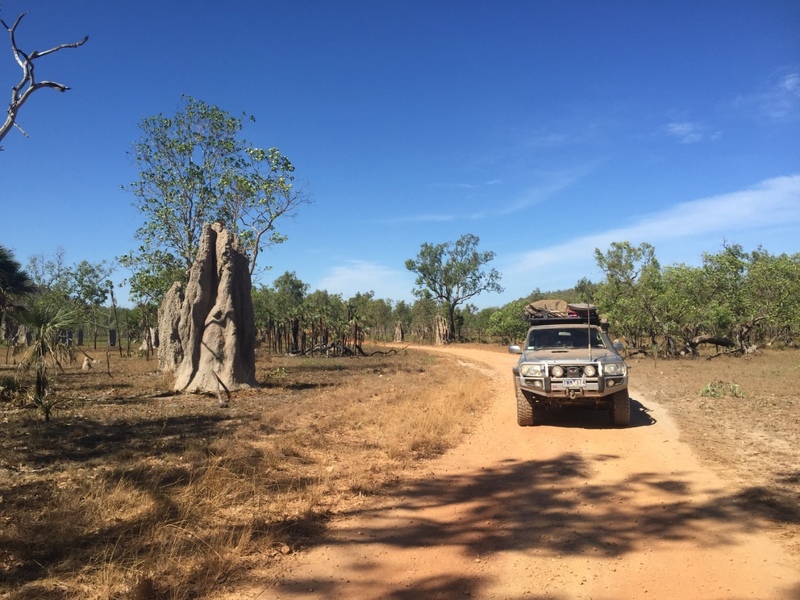 Further up the track found some Magnetic Termite Mounds where the termites build their nests on a north south angle so that the widest part faces either east or west providing one side shade at any time – very clever little termites! Some of the mounds towered over the car. 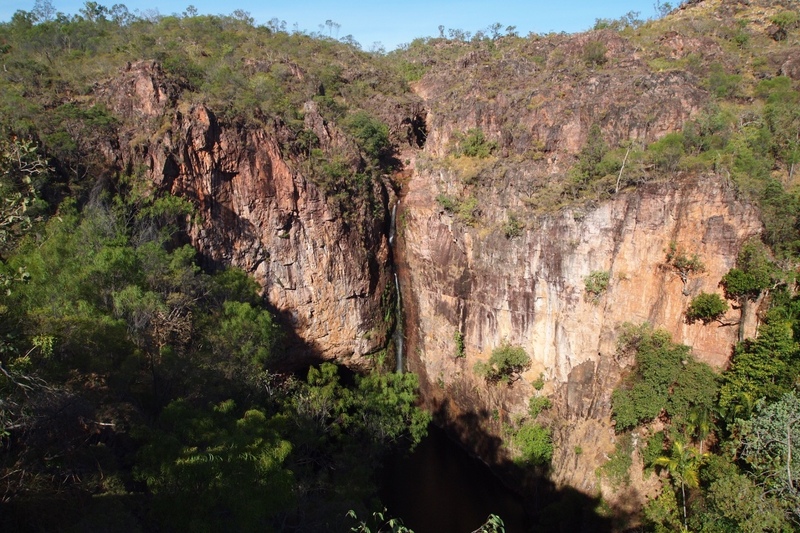 We arrived at Sandy Creek at lunchtime and after setting up camp enjoyed a short shady walk into the spectacular waterfall and large plunge pool. 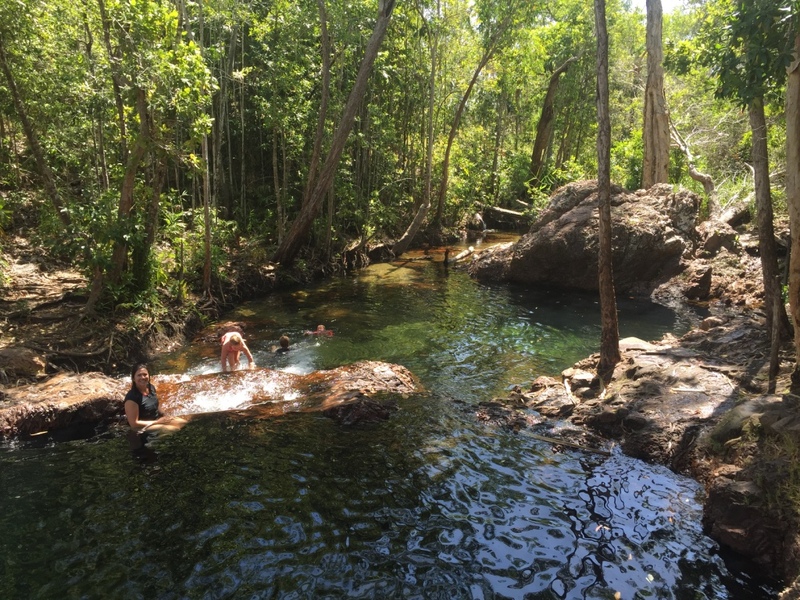 Yet another spectacular swimming spot…perfect to cool down from the heat of the day. 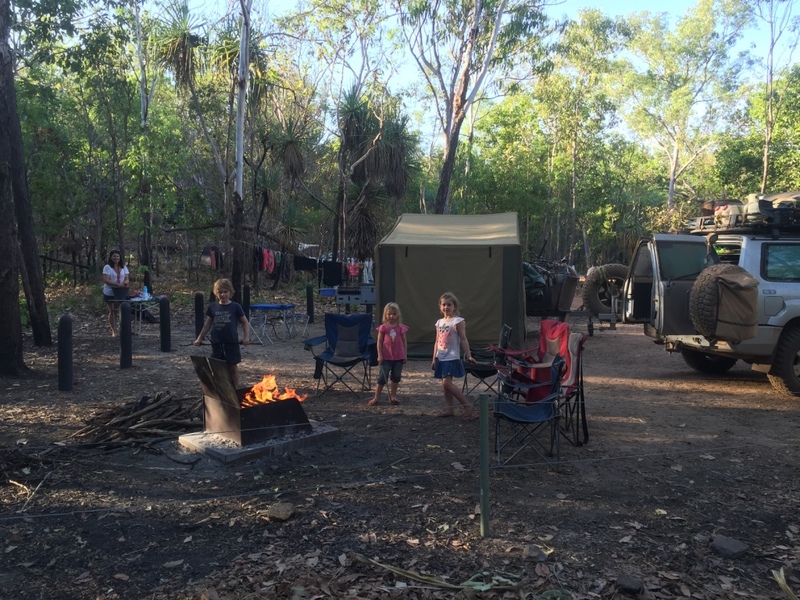 Sandy Creek only has a handful of sites, set in a bushy location and you can have campfires, so we decided to base here and to see the rest of Litchfield. 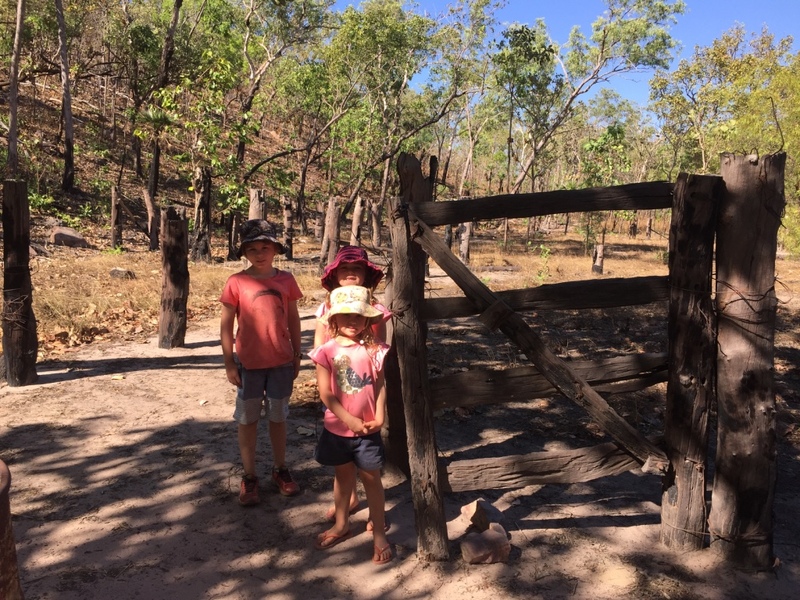 We set off early the next day visiting the Blyth Homestead – an historic site from the former cattle station and tin mine. 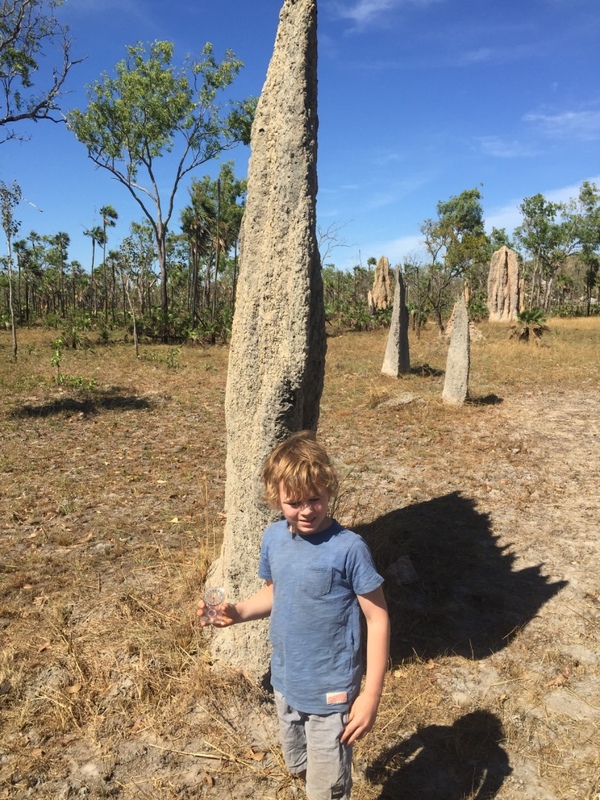 Next we visited the official Magnetic Termites site and learned more about the clever little insects. 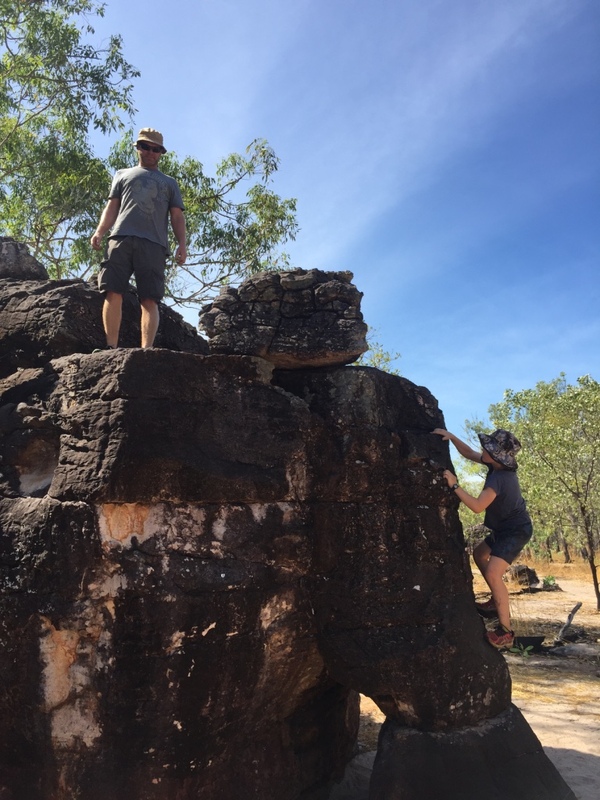 After the termites we visited the Litchfield Lost City where we enjoyed wandering around amazing sandstone structures formed over millions of years – Aaron climbed some too. 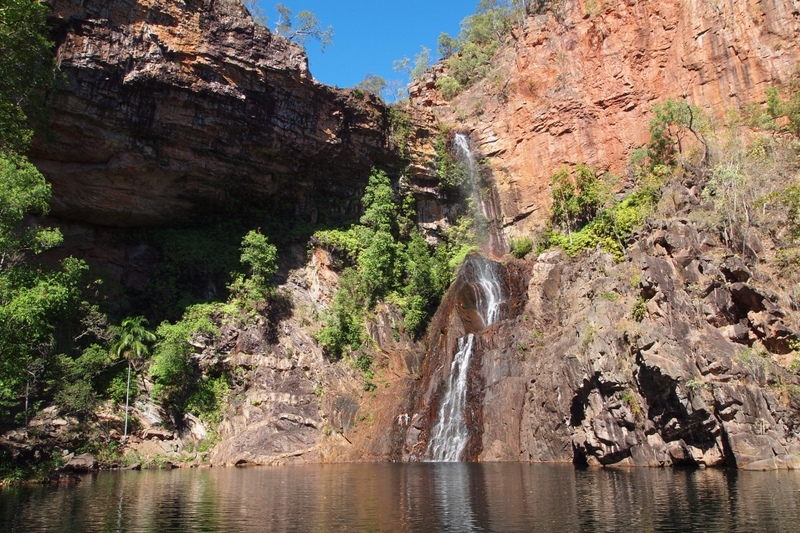 By mid morning it was getting hot so we headed to the Florence Falls which are only a short walk down 155 steps (although Aaron and I counted 165) to the bottom pool for a swim over to the waterfall. Another beautiful waterfall we all swam out to the falls and were amazed at their strength the fast flowing water pushing us away. 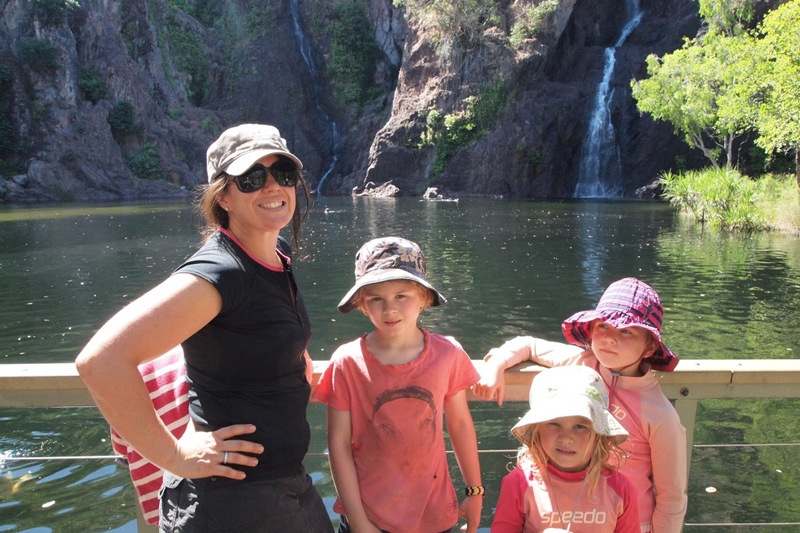 After lunch we headed to the Buley Rock Pools (because Aaron insisted) and we were glad we did. 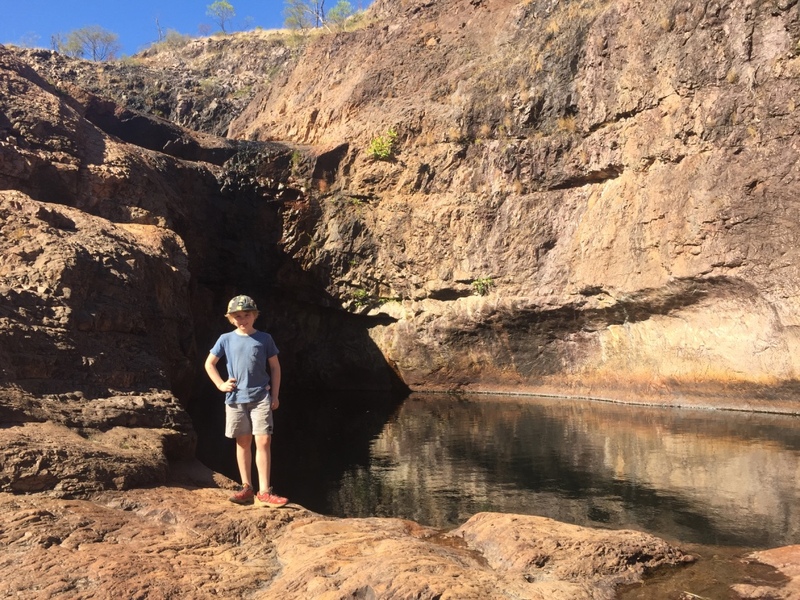 Just when we didn’t think it could get better Buley Rock Pools was awesome fun for the kids – a series of gorgeous rock pools with water bubbling into some deeper larger plunge pools. 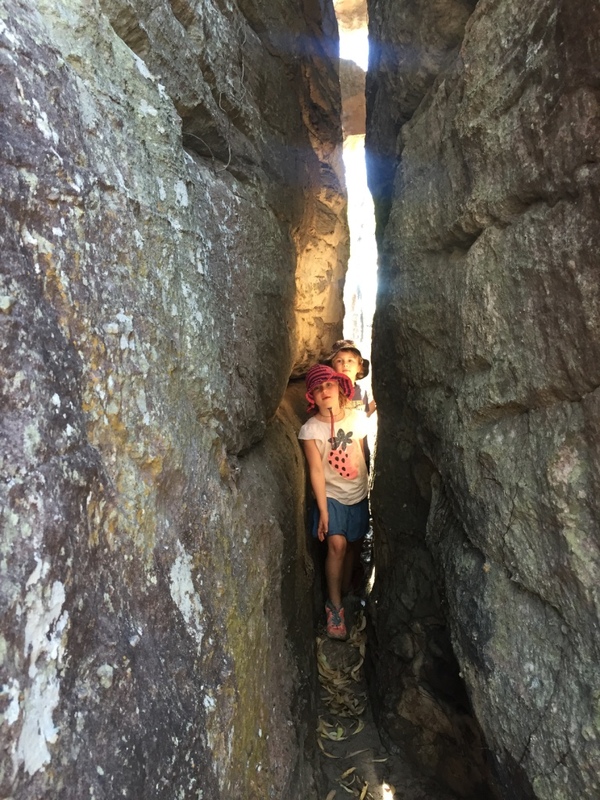 The children especially enjoyed this spot. 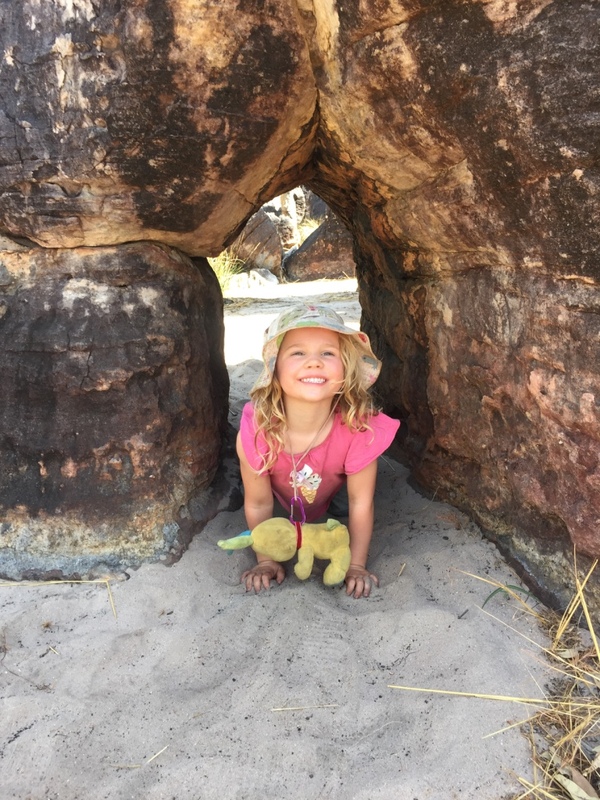 We headed back to camp and understandably the girls fell asleep in the car. 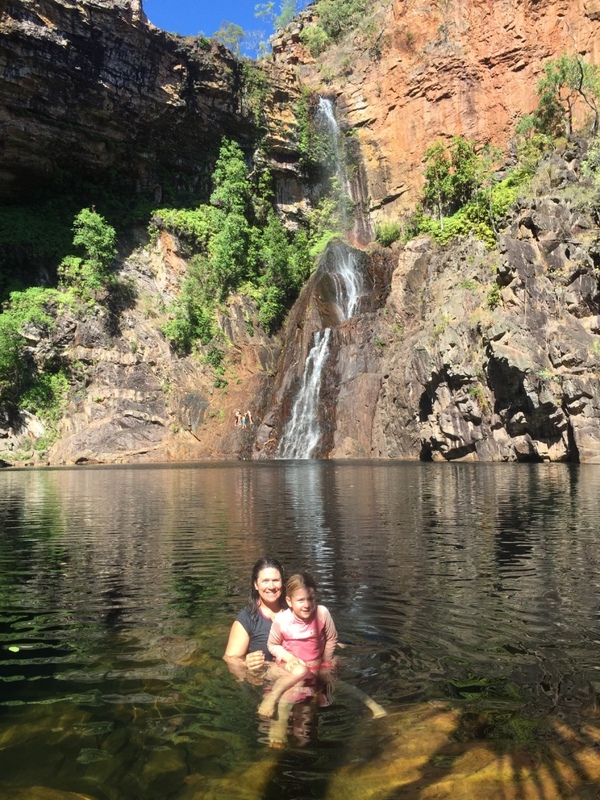 We called into Tolmer Falls, which are not accessible for swimming, and Aaron and I walked in for the view of the stunning waterfall reduced to only a trickle as so late in the dry. 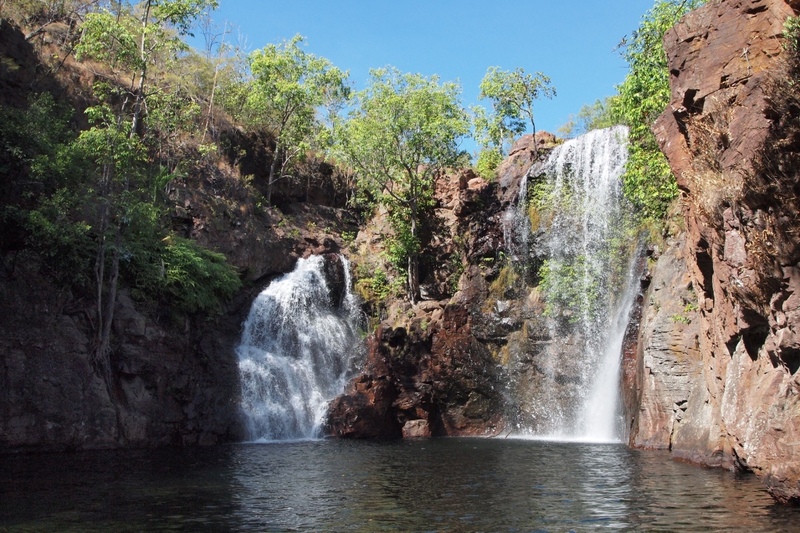 After three nights in Litchfield we packed and in the morning on the way out we visited the Wangi Falls which has two waterfalls into a large plunge pool. 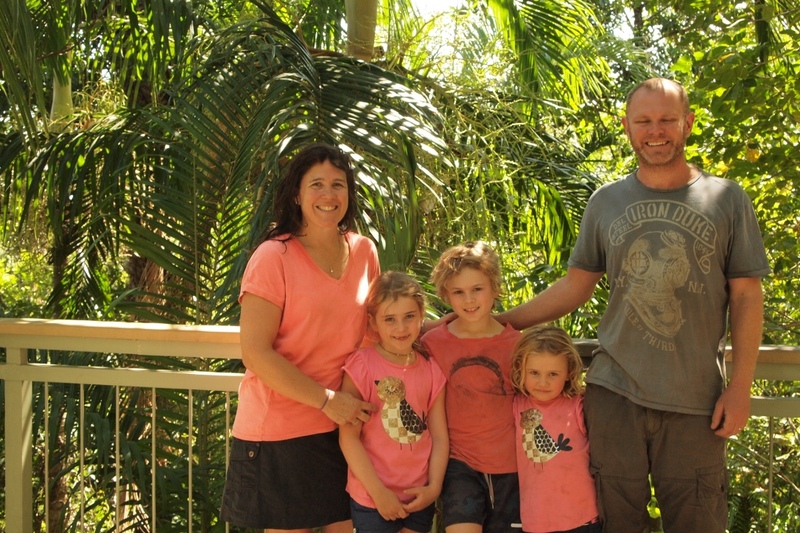 We all had a refreshing swim followed by a walk in the rainforest. 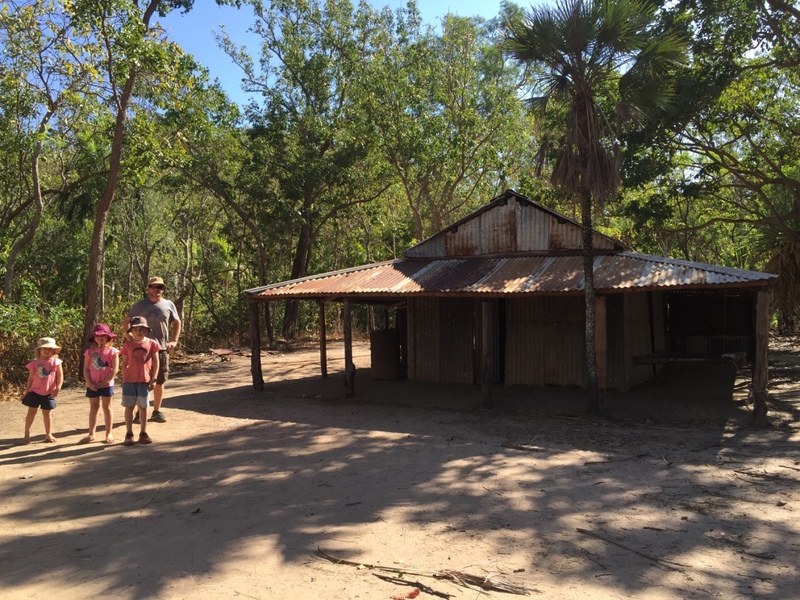 This was very busy due to the proximity to Darwin it has large numbers of tour bases and self drive tourists. 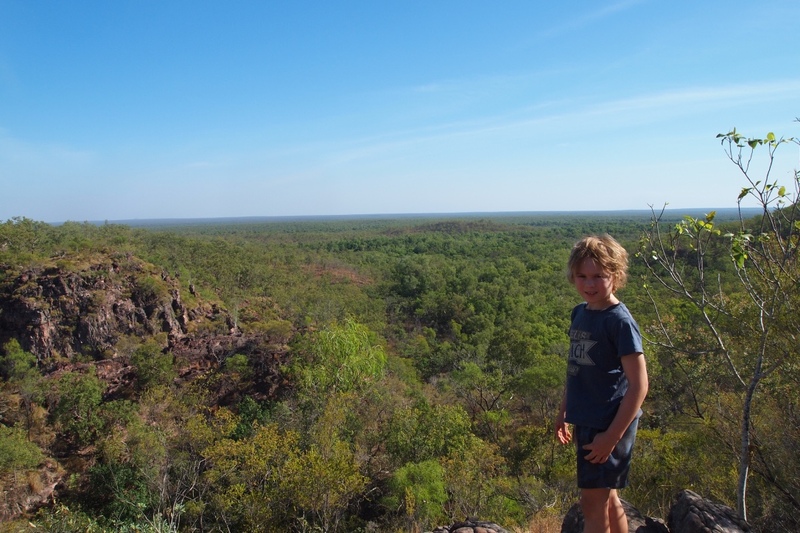 All the sites at Litchfield were spectacular but it was different being in a beautiful environment with so much infrastructure to cater for the large volume of tourists. Still we were really impressed with Litchfield yet another amazing location on our trip.